In one-fourth the time it takes to obtain a bachelor degree, an individual can begin working and become certified as an ophthalmic assistant. With an estimated need for an additional 6,000 ophthalmic technicians in the U.S., a career in eye care is ideal for anyone who is self-motivated, has a desire to help people, and wants to make a difference. According to "Measuring Up 2008: The National Report Card on Higher Education" by the National Center for Public Policy and Higher Education, “increases in college tuition have outpaced price increases in other sectors of the economy.”¹ Since 1982, the national price of college has risen nearly 450% in current dollar prices. The deterioration of college affordability is forcing students and future professionals to get smarter about the educational and training pathways they choose. The burden of long-term loans make employment as an eye care professional a quick and an inexpensive alternative route to career success. Certified ophthalmic medical personnel (OMP) play a crucial role in the delivery of quality care in the allied health profession. 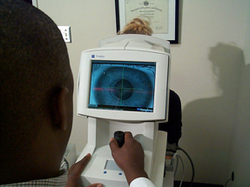 OMP work alongside ophthalmologists and assist in areas such as surgery, patient education, and compliance. In eye care, the Joint Commission on Allied Health Personnel in Ophthalmology (JCAHPO) is the leading international provider of certification and continuing education to ophthalmic personnel. JCAHPO’s mission is to enhance the quality and availability of ophthalmic patient care by promoting the value of qualified allied health personnel and by providing certification and education. The organization currently has nearly 18,000 certificants from around the world. JCAHPO President William H. Ehlers, MD observes the value of pursuing a career in the ophthalmic allied health profession. “At many institutions, the cost of higher education is so expensive that it becomes a poor investment in an individual’s future. Candidates who want a career in an exciting area of the health care industry can pursue continuing education opportunities and certification as an eye care professional,” adds Ehlers. On-the-job-training is required for JCAHPO certification, which can benefit candidates by allowing them to work while they prepare for the certification examination. This can help significantly reduce unnecessary debt. Another advantage of a career as an ophthalmic assistant is that the profession is in the midst of a staffing shortage, as Dr. Ehlers notes. An independent home study course and specified work experience. Educational resources available online include courses at http://www.myjcahpoce.org or JCAHPO’s newly launched Webinar series for eye care professionals. On http://www.myjcahpoce.org , individuals can select from a variety of courses, track progress, and earn credits toward certification examination eligibility. As the American employment landscape continues to change, students and future professionals should be looking to sensible and affordable pathways such as eye care for career success. For more information on JCAHPO certification or a career as a certified ophthalmic medical professional, visit http://www.jcahpo.org or http://www.myeyecareer.org . ¹ “Measuring Up 2008: The National Report Card on Higher Education.” The National Center for Public Policy and Higher Education, 2008. p. 8. ² Kroll, Andy. “Shut Out: How the Cost of Higher Education is Dividing Our Country.” April 3, 2009 ; TomDispatch.com. Retrieved November 17, 2009: commondreams.org/view/2009/04/03-3.